This was the fourth year I have participated in Chase the Coyote, twice before running the 14K challenge course and the second year doing the 25K. This is without a doubt my favourite race every year and the local Running Free owners Jodi and Norm put on an amazing event. Since this is a combination 50K, 25K and 12K event, the start times are staggered and the 25K wave goes out at a very civilized 8:30am. 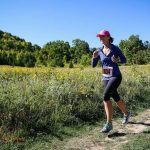 This race takes place at our local trail of Mono Cliffs, parking is included in your race entry, but I highly recommend getting there early as the parking lot fills up and some people do have to park on the road. There are 6 washrooms at the start, there were no line ups when I was there, but I imagine that before the 12K wave starts it gets a bit busier. The mood is very upbeat, music is playing and volunteers are everywhere helping with Bib pick up or selling the awesome Coyote branded swag. Right from the start we run up a nice hill, lots of rocks and washout, great to get your heart pumping straight out of the gate! The race is capped at 400 people for the three distances combined, so although the trail gets very narrow in places, it didn’t feel crowded. Everyone is very considerate and provide warning about “passing on the left” and the majority don’t wear headphones to be aware of surroundings. A few KMs in we come to “Cardiac Hill” which is a ridiculously big, rocky rooty hill that just seems to go on forever – absolutely stellar. This year, resident photographer Wayne took pictures as you hauled yourself to the top, when everyone was looking their best! Lots of ups and downs follow and we come to the lookout, which gives you an incredible view of the forest – definitely worth stopping and drinking in the scenery (and possibly taking a selfie). Continuing on, we go into Dufferin Forest which is super sandy, so again you have to watch your footing. There is a quick “check in – check out” section at the beginning, it’s very well organized with volunteers as they take down your number and mark your bib. The volunteers at the aid stations along the route are AMAZING! Super enthusiastic, they never fail to give you a boost as you make your way. Lots of snacks, water and Skratch electrolyte drinks were available (those M&M’s really hit the spot!) and the stations were well placed along the course. Port a potties were also placed at a few of the stations. Two more sections to note in the course are “68 steps to ruin” and “the roots of all evil”. The 68 steps are tough, but to be honest the hill afterwards is even more so! They might as well have kept on adding steps!! Close to the end is the “roots of all evil” section, and just as the name suggests, it is filled with roots just waiting to trip your tired legs! Once out of roots it is the best three kilometers to the finish, wide, gentle soft trail and a beautiful downhill fast finish into the parking lot! The medals are beautiful, and the swag is awesome – this year we got amazing warm running glove-mittens that I’ll for sure be wearing when the weather turns colder. Every year they have made sure we don’t leave the race hungry, this time we were given subs, cookies, watermelon, bananas and apples. Again, the volunteers outdid themselves handing out food, selling the Coyote swag from years past and cheering on the finishers. Great awards ceremony afterwards with prizes given to the overall winners and age group wins. I will definitely run this race again next year, the course is challenging and engaging, the volunteers are excellent, the swag is great and the atmosphere is just the best. It was wonderful to chat with other runners along the way who had travelled from all over Ontario to participate, and since it is a local race I saw so many familiar faces from the running and fitness community. Jodi and Norm, thank you again for putting on an amazing event, keep up the great work!! !